Home - DKV Luxembourg S.A.
Because you are worth more. We insure you in every situation with an intelligent health insurance, which provides you the best possible health services – tailor-made to your needs. The supplementary health insurance from DKV Luxembourg provides you with security and optimal medical care in case of illness. Enjoy your life worry-free with moments of happiness and DKV Luxembourg – we care about you and your health! Because you are in good hands with us. Complete protection worldwide, for long-term stays abroad! Sorry, no suitable product found. Please contact one of our agents or use our contact form. And you can be certain of this. With the DKV Luxembourg health hotline you receive information quickly and, above all, straightforward. A special team of doctors, nurses, dieticians and healthcare professionals will be on hand to answer your personal questions! 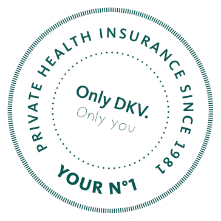 With DKV Luxembourg you are well protected, because we offer you the best possible health care in a straightforward manner. We know how important qualified contact persons are for answering your questions about your health and referring you to a specialist. We help you to understand diagnoses, to ask the right questions and to deal with an illness. Because you receive good advice from us. Competent and always available on location. Because your health is simply worth more, your personal contact person will visit you at your home on request. Of course you can also schedule a personal appointment with us at our offices. Use our contact form to request a consultation, and your personal agent will get back to you shortly. Because when it comes to your health, nothing is more important than personal and competent advice - tailored to your individual needs and non-binding.